Seattle’s EMP Museum houses the Science Fiction Hall of Fame, and yesterday, announced the 2015 cohort of inductees: James E. Gunn, Georges Méliès, John Schoenherr, Hayao Miyazaki, Kurt Vonnegut and Jack Gaughan. 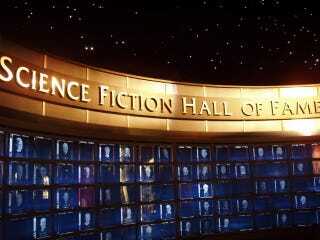 This year’s inductees are an interesting mix of author and artists: The Science Fiction Hall of Fame was originally located at the Gunn Center Center for the Study of Science Fiction at the University of Kansas, named for James Gunn, one of the last Golden Aged authors still alive and writing. The other author, Kurt Vonnegut wrote books such as Slaughterhouse-Five and Cat’s Cradle. The two filmmakers inducted this year are Georges Méliès, who directed films such as A Trip To The Moon and The Impossible Voyage, and Hayao Miyazaki, who co-founded Studio Ghibli, and was responsible for numerous well loved filmed. Two illustrators, John Schoenherr and Jack Gaughan were also included. Gaughan was an illustrator who worked primarily with Ace and DAW Books, while Schoenherr best known for his work on Frank Herbert’s Dune and other classic covers that graced the likes of Analog Magazine and others.